Leading Manufacturer of optical spectrum analyzer 100g, optical spectrum analyzer osa 100g and optical spectrum analyzer meter from Faridabad. Channel drop function for single channel isolation and tunable filter applications. PMD test option based on fixed analyzer method. The OSA-150 is JDSU’s basic OSA with an optical resolution of 100 pm to measure CWDM and DWDM networks with moderate channel spacing of 100 GHz to CWDM. The high resolution OSA-18x DWDM analyzers are suited for testing DWDM networks with tight channel spacing down to 50GHz. In addition the OSA-181 provides a unique channel drop function to isolate single DWDM channels from the spectrum. The ultra high resolution OSA-500 and OSA-500R have an industry leading resolution band width of 35 pm for measurements in ultra DWDM networks with channel spacing down to 25 Hz. 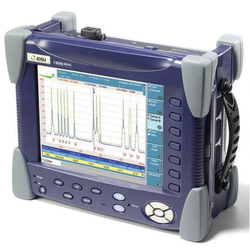 Looking for Spectrum Analyzer Machine ?